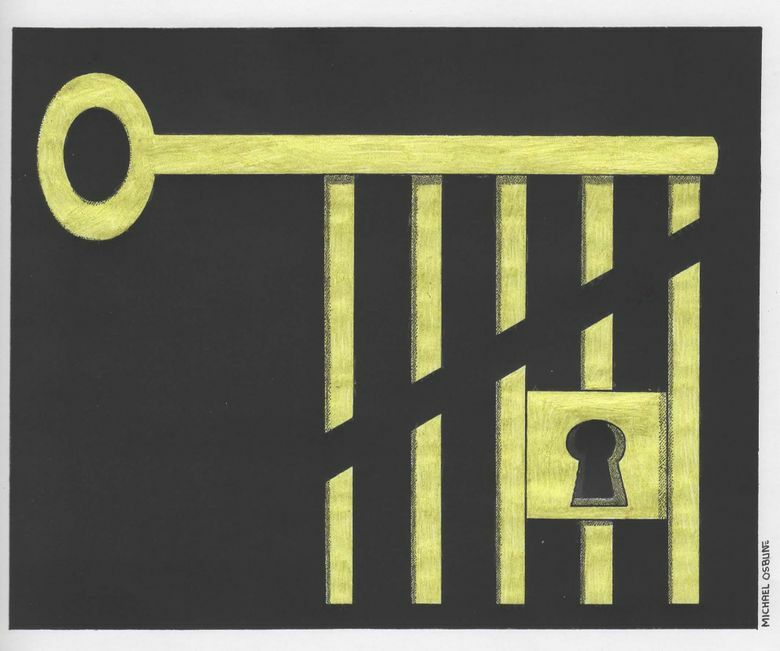 This artwork by Michael Osbun refers to the cutting of prison sentences. The state Legislature wisely lifted a decades-old ban on higher education in prison. Two decades ago, in the midst of a crime wave, the state Legislature ended postsecondary education for prisoners. In retrospect, it is clear the decision was shortsighted and ignored rock-solid research showing education behind bars effectively prepares inmates never to return. The Legislature has finally changed course, lifting a 1995 law that banned state funding from being used for college courses in prisons. It is not a full reversal; classes are limited to two-year degrees, but it is a welcome step. The bill now heads to the desk of Gov. Jay Inslee, who strongly supports lifting the ban. Washington lawmakers were inching this way already. Private philanthropic funding has paid for college-level courses at the state prisons in Monroe and Walla Walla since 2007, and last year lawmakers allowed a broader pilot program. But for most inmates, classes have been limited to high school completion work and nondegree programs. The new legislation — sponsored by Republican Sen. Maureen Walsh of Walla Walla, home of the state’s first prison — allows inmates heading toward their release to walk out the prison gates with a business or vocational associate degree. The best argument for expanded prison education is not about liberal notions of redemption — although those are valid. Instead, fiscal conservatives should welcome prison education programs that have an astonishing 18-to-1 return on investment in deterred crime, prosecution and incarceration costs, according to research by the nonpartisan Washington State Institute for Public Policy. Those returns are possible because three out of five male inmates have middle-school reading levels, or worse. The literacy levels for female inmates is even worse. When inmates leave prison with better education and better job prospects, they’re far more likely to stay out of trouble. Research by the RAND Corporation found graduates of prison education programs have a 43 percent lower chance of returning to prison. The pilot program run by Walla Walla Community College has found even better results, albeit with a limited snapshot: Of the 141 inmates who earned degrees, just 8 percent returned to prison within three years. The new legislation allows the state Department of Corrections to dramatically expand educational offerings. Twenty-one existing vocational programs can be converted to two-year associate degree programs. Brian Walsh, who coordinates prison education programs for the Washington State Board for Community and Technical Colleges, estimated that 400 inmates a year can now be educated. The new authority is limited — no liberal arts degrees and no four-year degrees, unless the inmate pays for it. But if the expanded DOC educational courses prove to be longterm cost-savers for the state — and the research strongly suggests they will be — then future legislatures should revisit those limitations.